This article provides an overview of the spatial development of office building production in Brussels over the past fifty years. Due to the disappearance of agricultural and industrial jobs, most of the people who work in the Region now work in offices (two-thirds of the 724 000 workers). The continual spatial expansion of areas occupied by offices is symbolic of the development of the service sector as well as the economic prosperity of the capital, but is also an element of its fragility and complexity. The historical analysis of office building production reveals a spatial development which is centrifugal, asymmetrical and polycentric. The present study – initiated by the activities of the Review of office property (office monitoring centre) – was conducted in the framework of the collective work published by the Studies and Planning Department of the Ministry of the Brussels-Capital Region, entitled Bruxelles, ses bureaux, ses employés. It includes approximately twenty contributions, an original cartography and rich illustrations, and examines the many facets of a phenomenon which has greatly influenced the history of Brussels since the post-war years. Cet article se propose de donner un aperçu du développement spatial de la production de bureaux à Bruxelles au cours des cinquante dernières années. L’effondrement de l’emploi agricole puis industriel a fait du bureau le lieu d’activité principal des personnes travaillant sur le territoire de la Région (deux tiers des quelque 724 000 travailleurs). L’extension spatiale continuelle des surfaces occupées par les bureaux est emblématique de la tertiarisation ainsi que de la prospérité économique de la capitale, mais est également un élément de sa fragilité et de sa complexité. L’analyse historique de la production de bureaux révèle un développement spatial à la fois centrifuge, asymétrique et polycentrique. La présente étude, initiée par les activités de l’« Observatoire des bureaux », a été menée dans le cadre de la publication de l’ouvrage collectif édité par la Direction Études et Planification du ministère de la Région de Bruxelles-Capitale, intitulé Bruxelles, ses bureaux, ses employés. Il réunit une vingtaine de contributions, une cartographie originale ainsi qu’une riche illustration et aborde les multiples facettes de ce phénomène qui a fortement marqué l’histoire de Bruxelles depuis l’après-guerre. Dit artikel geeft een overzicht van de ruimtelijke ontwikkeling van de kantoorproductie in Brussel tijdens de laatste vijftig jaar. Door de forse afname van de werkgelegenheid in de landbouw en daarna in de industrie is het kantoor de arbeidsplaats bij uitstek geworden van de werknemers in het Brussels Gewest (twee derde van de ongeveer 724 000 werknemers). De constante ruimtelijke uitbreiding van de kantooroppervlakte staat symbool voor de uitbreiding van de tertiaire sector en de economische welvaart van de hoofdstad, maar is tegelijk ook een oorzaak van haar kwetsbaarheid en complexiteit. De historische analyse van de kantoorproductie wijst op een tegelijk centrifugale, asymmetrische en polycentrische ruimtelijke ontwikkeling. Deze studie, waartoe de aanzet werd gegeven in het kader van het “Overzicht van het kantorenpark”, werd uitgevoerd met het oog op de publicatie van het collectieve werk Brussel, haar kantoren en bedienden, uitgegeven door de directie Studies en Planning van het Ministerie van het Brussels Hoofdstedelijk Gewest. Het werk, dat een twintigtal bijdragen, een originele cartografie en een groot aantal illustraties bevat, behandelt de veelvuldige facetten van de kantoorproductie, die een grote stempel heeft gedrukt op de naoorlogse geschiedenis van Brussel. 2Rather than analysing the structure of the Brussels service sector in terms of the use or type of occupation of buildings, we shall focus above all on the evolution of the spatial extent of the office stock, and more particularly on the logic behind the choice of location. Whilst the overall surface area of offices increased from 500 000 m² in 1950 to more than 12.5 million m² in 2008, the areas where offices are located have multiplied, evolving from a compact region in the east of the pentagon area towards a fragmented polycentric structure which extends beyond the regional boundaries. With respect to the size of the city and its population, the office stock is exceptionally large. 3The historical and geographical analysis presented here takes into consideration only the buildings and building complexes whose gross above-ground floor area3 equals at least 1 000 m² of offices. The many smaller offices scattered throughout the city were not considered because they did not undergo a systematic verification (dating, surface area, occupation). They nevertheless represent approximately 14% of the total office stock. 4The information on the office buildings comes from a database created as part of the implementation of the Regional Land Use Plan (PRAS; ground survey conducted in 1996‑1997). It was updated with information on planning permission registered by the regional authorities in charge of the Review of office property. Various adaptations and verifications of the database (dating, occupied surface area, number of car parks, uses, etc.) were carried out in 2008 and 2009 using information from different sources (consultancy firms, estate agents, field verifications, municipal archives, etc.). The figure indicates, first of all, the relative share of the surface area of offices with respect to the total developed surface area of each municipality, with all municipalities combined. 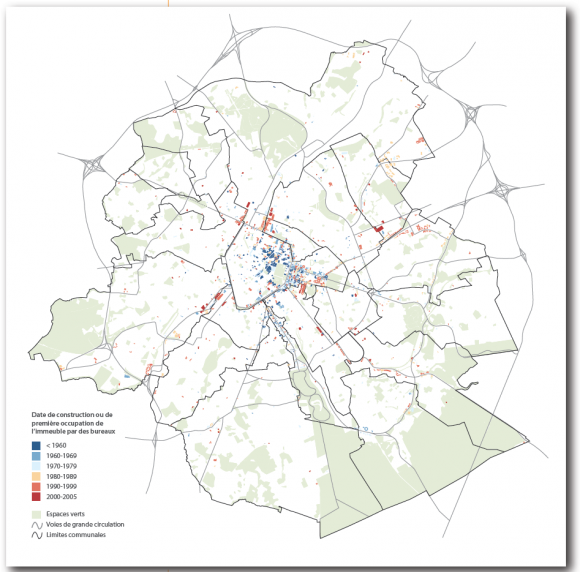 The proportion occupied by offices in Brussels (26.2% of the total developed surface area) and especially in Saint-Josse (37.6%) – a small municipality in the inner ring directly adjacent to the Central Business District – is very high. The municipalities located outside the areas favoured by offices – especially those located in the western part of the city – have very low percentages. The figure also indicates the relative share of each building size category in the office stock. 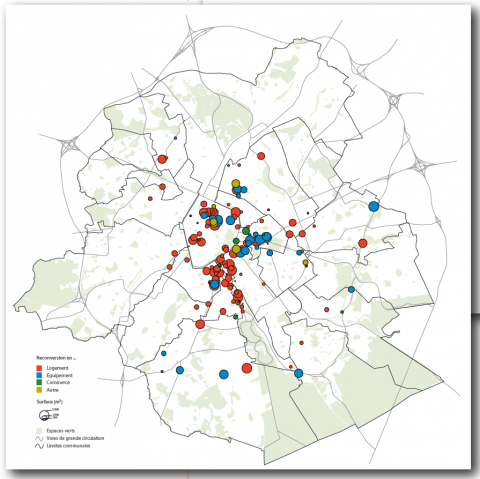 High-rises are over-represented in the municipalities of Brussels and Saint-Josse, thus increasing the percentage of very large buildings, whereas the municipalities located further from the centre have relatively a high number of average-sized and large buildings, which is typical of the business parks and semi-detached offices which are commonly found there. 5The dates indicated refer to the construction of the building (in the case of office buildings created for this purpose) or to the first occupation by offices (in the case of buildings which had another use originally). In the case of construction on a plot which used to be occupied by offices, only the date of the new building is retained. This results in an underestimation of surface areas from before 1960. 6Whilst investments in the construction/renovation of offices were negligible with respect to investments in the manufacturing and industrial sector before the Second World War (De Beule 1994; Vandermotten & Marissal 1998), they have reached an average of more than 3 billion euros per year in Brussels today. This evolution has followed the economic cycles of the past 50 years, but the share of offices (private and public) in productive investments as a whole has continued to increase, revealing long-term dynamics beyond the economic cycles, related to the development of the service sector of the economy in general and the role of Brussels as a driving force in administrative, command and management activities at Belgian level in particular. This evolution is not linear and the growth factors are variable. The position and role of stakeholders (owners, developers, investors, occupants) and the geographical rationale behind office locations change continuously (Laconte 1978; Mérenne-Schoumaker 1991; Recollecte 1994). An analysis of the past allows these changes to be mapped and gives meaning to the current geographical structure. 7For centuries, Brussels has enjoyed great political and economic authority, which is reflected in the presence of many official buildings concentrated in the upper city, around Brussels Park, Place Royale and Sablon. The designation of Brussels as the capital of Belgium in 1831 prompted the growth of the administrative function. With the development of the role of the state, as well as financial institutions and the large Belgian capital, the number of administrative and management buildings in Brussels grew, occupying manors and new buildings built for such use. Most private companies and public bodies owned their buildings. They paid special attention to the architecture of their head office or headquarters, which conveyed their image. Let us mention, among others, the Railway Ministry (1889‑1892, Rue de Louvain), the Shell Building (1931‑1934, Rue Ravenstein), the Banque Nationale de Belgique (1948‑1953, Boulevard de Berlaimont) and the Caisse Générale d’Épargne et de Retraite (1947‑1953, Rue du Fossé-aux-Loups). 8Until the 1950s, the big administrative buildings were concentrated within a limited area comprising the Brussels Park area (the age-old location of political and economic powers), the area around the cathedral (financial centre which emerged at the end of the 19th century), the small ring and the Léopold quarter (former middle-class and aristocratic residential neighbourhood which began to undergo changes during the interwar years). They constitute the first service sector hubs – still scattered – where the Central Business District (the central neighbourhoods where the main service activities were concentrated) would later become established. The buildings were erected according to a traditional urban system, terraced along each street, although the more recent buildings (mainly those along the North-South junction) were more modernist. 9The centrality and proximity of the main political and financial bodies were the essential factors which determined location. The city centre was thus the area where most offices were concentrated. This is explained by the accumulation of various externalities, in particular the existence of specialised labour and the reduction in the cost of information access and exchange (services provided, advice, exchange of documents, etc.). 10The prosperity and development of the service sector of the economy, the internationalisation of the capital (establishment of the provisional seat of the European institutions in 1958, the political seat of NATO in 1967 and many foreign firms), and in particular the emergence of a major office market following the arrival of the first British investors and developers, had a considerable impact on the urban landscape. 11The birth of the real estate market was based on rental and speculative products, and had a major impact on the service sector geography. More and more office buildings were being built for marketing purposes with no prior knowledge of the final user (turnkey construction). This led to a certain standardisation and functionalisation of buildings and a levelling out of their architectural quality. 12As a real estate asset, office buildings developed with respect to their ground rent, which caused new factors in terms of location to intervene: cheaper plots, easy access by car or public transport (metro and train), etc. Although the old factors were still important, the new real estate programmes had more autonomy in terms of location, all the more so since a regulatory framework did not exist yet in the area of land use designation. That being the case, the spatial structures of service sector production were influenced by the speculative logic of investors more than by the choice of future occupants, “by overvaluing the most dynamic urban areas which ensure the best return on investment” (Crouzet 2003). 13The intensification of service sector development, accompanied by the urban exodus of the middle classes beguiled by the idea of a suburban dwelling, had a major impact on the city: pollution caused by road traffic and the demolition of thousands of dwellings in the historic urban fabric replaced by bigger modern buildings, including the multiple high-rises – most of which were erected during a relatively short period between 1965 and 1975 (Demey 2008). The weak regulation of the market, a muddled urbanistic policy and the weak resistance exerted by the residential function intervened more or less, but the expansion of office buildings was a reality at the time. 14The service sector hubs around the Léopold quarter, Brussels Park and the North-South junction grew, forming a true monofunctional area: the Central Business District. The centre of Brussels experienced a relative loss of activity with respect to real estate production in the areas further from the centre. New office complexes were built in areas still close to the centre, with a high proportion located in municipalities in the eastern and southern parts of the city. They appeared above all along major roads, where a more or less continuous series of office buildings mixed with retail business activities and dwellings, i.e. Avenue Louise, Avenue de Tervueren and Avenue de Cortenbergh. The existence of rapid transport infrastructures (development of the metro and urban motorways), the urbanistic framework and the qualification profile of the population are probable explanations for real estate developers’ enthusiasm for these locations. 15The North quarter – which was razed almost entirely to make room for the Manhattan plan – is a vast international business area proposed in the 1960s, and was supposed to add to the growing real estate offer in the area near the centre. The economic crisis and sluggish market in the 1970s made the area one of the most resounding real estate failures. From the end of the 1960s, there was an emergence of buildings built and occupied by their owners in a prestigious landscaped setting which was easily accessible by car (for example the Royale Belge on Boulevard du Souverain, Glaverbel and CBR on Chaussée de La Hulpe). Concerned about the image conveyed by the architecture and setting of their building, the occupants’ reasoning with respect to real estate was in line with that which prevailed until the 1950s, transposed to a landscaped setting, close to the neighbourhoods where the executive and managerial staff lived. There was a more general move of office buildings – built in a rather unexceptional architectural style – further from the centre in the 1970s, as a result of a speculative process initiated by real estate market stakeholders who were banking on the advantages of accessibility by car and suburban workers (Rue de Stalle, Boulevard Léopold III, the Woluwe Valley). Semi-detached construction4 was the preferred choice, rather than the classic terraced buildings along the street line. 17There was therefore a first phase of strong growth in production organised geographically according to a general process of dispersal from the inner ring and outer ring, favouring a precise series of locations, whilst preserving the traditional features of choice of location. The western part of the city – traditionally working-class and industrial – however, experienced only a marginal increase in the number of offices. 18The end of the 1970s was marked by a first overproduction crisis which led to a decrease in office production volume. This decrease affected the central neighbourhoods above all, to the benefit of areas further from the centre, which confirmed the momentum of growth recorded since the 1960s. As such, the polycentric character of office production was reaffirmed, whereas the centre became somewhat less popular, apart from the Léopold quarter, where the European institutions and foreign companies were located. Several elements help explain the temporary lull in the market: a decrease in real estate investments related to the oil crisis; a slower increase in administrative jobs; and the appearance of a large number of vacant offices due to several years of overproduction. In addition, the first regulatory land use designation plan for the entire urban area of Brussels was adopted in 1979 – the Area Plan – which sought to limit development and channel the areas where offices were located. Administrative areas were mapped out, confirming an existing situation and proposing new areas for development further from the centre (in particular in Jette, Anderlecht and Schaerbeek), and taking into consideration the polycentric relocation of offices in the urban area. 19At the end of the 1980s, the existing hubs located further from the centre continued to develop (Boulevard Paepsem and Boulevard de la Woluwe) under the impetus of foreign companies in particular. Although the Area Plan validated the administrative character of some of these hubs, others were located on plots which were initially intended for industry or for companies of an urban character. The lack of interest on behalf of companies involved in production activities and the success of the first administrative establishments transformed some of the industrial areas into business parks occupied mainly by offices (Boulevard Paepsem, Boulevard Léopold III, Rue Colonel Bourg). 20Although it is clear that certain buildings in areas located further from the centre still played the card of prestige by choosing quality urban environments and the proximity of qualified workers, the new units placed more emphasis on the functional character required by service companies. The buildings usually had an unoriginal design, with two or three floors, and were popular in particular among advanced technology or creative service companies of all types which were flourishing at this time. 21Finally, let us mention the creation of outlying hubs (outside the Region) along the ring road, at the junction with the motorways leading to Ghent (Grand-Bigard), Zaventem airport (Diegem, Keiberg) and Liège (Lozenberg, Ikaros). The development of offices in the outskirts of the city marked an evolution towards a new relationship between the city and its periphery. High rental prices, age and fittings made urban offices less suited to new needs in terms of mobility and flexibility, resulting in a process of migration or creation in hubs located further from the centre and in the outskirts, which were seen as complementing the Brussels hubs rather than competing with them. 22The increase in the number of political and administrative bodies following the regionalisation of the Belgian state, the European Union enlargement, the spatial expansion of the European institutions (Commission, Parliament, Council, specialist committees) and the ageing of the office stock from the 1950s and 1960s have triggered intense production and renovation activity5 focused on centrality as well as on the development of hubs located further from the centre and in the outskirts. The general resumption of activity – out of step with the real estate recession in Europe – has had a stimulating effect on office building production. 23The North quarter and the area along the canal are developing after a prolonged stagnation, the European quarter is expanding and becoming more dense with the addition of new EU member states, and the area around the South Station is being transformed. In these cases, growth is supported above all by the public, Belgian and international sectors. The regional, community, federal and European occupants are over-represented in the CBD, the North quarter and the new annexes along the canal (KBC, Ministry of the French Community), on Avenue de la Toison d’Or (Public Buildings Administration and Ministry of Middle Classes and Agriculture) and on Rue des Petits Carmes (FPS of Foreign Affairs). 24This redefinition of the offer is also rendered in the development of a series of renovation programmes (modernisation of several office towers, gradual extension of the building stock of the European institutions, renovation of the building stock from the post-war years), rehabilitation programmes or programmes for the re-allocation of important sites (state administrative district, Tour et Taxis) or new buildings which reveal a bigger concern about the architectural aspect and the brand image.6 This renewal indicates a restructuring of the market towards products which are more modern, better equipped and longer lasting,7 thereby acquiring new users or reoccupying dilapidated or under-equipped buildings. 25In addition to these office buildings located more in the centre, there are major programmes in the areas located further from the centre along the Namur motorway in Auderghem, Boulevard de la Plaine in Ixelles, Boulevard Industriel in Anderlecht, Avenue Marcel Thiry in Woluwé-Saint-Lambert and Rue Colonel Bourg in Evere, confirming the appeal of these locations. Accessibility by car and secondarily by public transport has played in favour of these areas, which are listed – often a posteriori – as administrative areas in the new regulatory plans (land use map of the Regional Area Plan in 1995, followed by the Regional Land Use Plan in 2001). Furthermore, the land use planning policy insisted on limiting the spread of offices in the urban fabric to the benefit of specific functional areas situated in the four corners of the city.8 We must be careful, however, not to consider the hubs located further from the centre and in the outskirts of the city9 as new centralities competing with the city centre, in as much as they are lacking in terms of facilities or functional variety. Instead, a specialisation is under way: the central areas and certain hubs located further from the centre tend to emphasise their role as urban referent for financial and real estate activities, liberal professions and public bodies, whereas the hubs located further from the centre and in the outskirts of the city attract activities related to industrial production, storage, commerce, media, research/development and advanced technology. 26Following this diachronic analysis, it may be observed that the geographical development of real estate production shows relative continuity throughout the entire period: in addition to a constant increase in the occupied surface area, there is a gradual spatial expansion. Concentric or axial growth may be observed, starting at the original political and economic command centre, followed by a relative decrease of central neighbourhoods in the volume of production due to the emergence of secondary hubs in areas further from the centre and in the eastern and southern outskirts of Brussels. These office complexes are located in very different urban environments and have characteristics specific to the activities which are carried out there. However, the traditional areas are still the main hubs for service sector activity, whilst maintaining the strong dichotomy between the upper and lower city and the western and eastern parts of the city. Since the office market is to a large extent the result of speculative initiatives which, at least at first, were weakly regulated, it is not surprising to see a significant under-representation of the traditionally manufacturing and working-class neighbourhoods with an immigrant population located west of the canal, which have been excluded from economic development since their de-industrialisation, with the exception of Avenue du Port. The reconversion of office buildings into dwellings was almost non-existent at the beginning of the 1990s, and has been gaining ground (CLI 1997; BRAT 2007), in particular in neighbourhoods where such an operation no longer generates economic loss due to the rapid increase in the value of residential property compared with the value of offices. This is the case in mixed or residential neighbourhoods in particular, such as Avenue Louise or the city centre, where there is a high demand for housing and where access by car, metro or train is not as easy. The reconversions are less straightforward, however, in the areas where there is a concentration of offices, despite a high vacancy rate. The pronounced specialisation of the world of real estate development and ownership structure (the office market is mainly a rental market, whereas the housing market is more an owner’s market) prevent a rapid amplification of the phenomenon (Lasserre 2009). 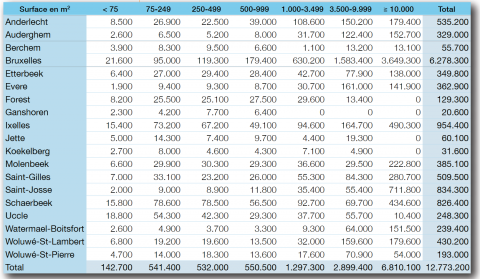 Currently, 45 000 m² of housing is created annually out of a total of 12.5 million m² of offices, of which almost 9% were vacant in 2008 (Doornaert et al. 2008). 27Today, the office market is dominated by the presence of Belgian and international public administrative and political bodies, in addition to the activities directly related to the presence of the EU (liaison offices, lobbies, diplomatic missions, NGOs, etc. ), as well as the financial sector and business services. The structure of the Belgian economy, with a weak presence of large national companies and the recent blows to the national banking institutions following the financial crisis, have made the presence of the European institutions the main driving force behind the Brussels economy, including the market sector. 28The nature of companies established in Brussels is the direct reflection of this: they are not headquarters of big transnational companies but rather their European or national branches, as well as consultancy firms or commercial law firms in connection with the companies located in the European capital. 29In as much as the services related to the presence of the EU seek close proximity with these institutions, for a long time they have been concentrated in the area located between Cinquantenaire Park and the boulevards of the inner ring. 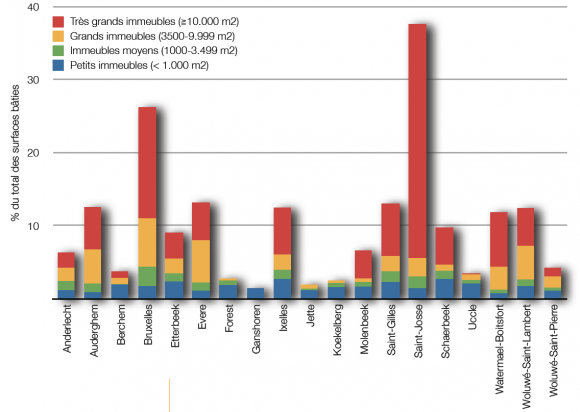 This geographical centrality is also seen with the Belgian federal, regional and community administrations, which favour the proximity of public transport interchanges rather than a relocation to outlying areas. On the whole, the choice of outlying areas concerns above all research and development activities and advanced technology or creative services (Vandermotten et al. 2007) which have undergone rapid development since the creation of the first industrial areas in the outskirts of Brussels in the 1970s. A certain functional polarisation of the office stock may therefore be observed: on the one hand, there are the central hubs, and on the other, there are the complexes located further from the centre and in the outskirts, with both maintaining a complementary rather than a competitive relationship. 30Each location presents a series of comparative advantages when future urban transformations are taken into account. The Diabolo project (improvement of rail connections with the Brussels-National Airport), the planned development of the ring road and the possible extension of the tram line on Boulevard Léopold III towards the airport are attempts to improve – at huge costs – the accessibility of areas located in the northeast outskirts of Brussels, which have been accessible almost exclusively by car until now. 31The Schuman-Josaphat railway connection and the RER, which will be operational in a few years, will also redefine the most advantageous locations for the development or reorientation of office buildings. 32The growing congestion of the main roads and the renewed interest in more central locations have prompted new considerations about densification and the construction of office towers, in particular in immediate proximity to areas well served by public transport. The rekindled enthusiasm for office towers – visible since the 1990s in the North quarter, renamed “Espace Nord” – is not, however, a sign that their numbers will increase in the near future. Office towers do not appear to be an essential alternative in terms of economic profitability. The pressure on land is not particularly strong in Brussels. And as the number of floors increases, the number of useable square metres decreases: a large amount of space is required for ducts, the lift mechanism becomes more complex, and management costs increase significantly. 33The current slow down in economic activity, the relatively high vacancy rates, the decrease in the surface area occupied per employee and the energy certification of buildings which will soon be compulsory, will also influence the future of office building production. The residential sector is becoming a stronger urban function, competing with the service sector in certain neighbourhoods. Will the almost constant growth of the office stock over the past decades reach a ceiling? Reorientation, densification, polycentrism, reconversion and renovation will set the pace for the evolution of the building stock in the years to come. If the service sector maintains its relevance for and within the city, for the time being it is difficult to assess the scope of future changes. BRAT, (2007), Les possibilités de conversion des immeubles de bureaux en immeubles à appartements, Région de Bruxelles-Capitale, Administration de l’Urbanisme et de l’Aménagement du Territoire, research report, unpublished. CLI, (1997), Transformation de bureaux en logements, Brussels-Capital Region, Administration de l’Urbanisme et de l’Aménagement du Territoire, research report, unpublished. CROUZET E., (2003), “Le marché de bureaux et les territoires métropolitains : vers un renforcement de la discrimination territoriale” in Espace géographique, 2, pp. 141‑154. DE BEULE M., (1994), “Bruxelles, une ville industrielle méconnue: impact urbanistique de l'industrialisation”, Les dossiers de la Fonderie, 1, Brussels, 72 p.
DE BEULE M. & DESSOUROUX C., (2009), Bruxelles, ses bureaux, ses employés, Ministry of the Brussels-Capital Region & La Fonderie, Special issue of the Review of office property, Brussels, 256 p.
DEMEY T., (2008), Des gratte-ciel dans Bruxelles. La tentation de la ville verticale, Guide Badeaux, Brussels, 200 p.
DOORNAERT A., DE BEULE M., HANSSENS B. & VANOBBERGHEN J.-M., (2008), Review of office property. Vacance 2007, Brussels-Capital Region, AATL and Société de Développement pour la Région de Bruxelles-Capitale. LACONTE P., (1978), Mutations urbaines et marchés immobiliers : le développement des immeubles de bureaux à Bruxelles, Université catholique de Louvain, Faculty of Law, Centre du droit de la gestion et de l'économie publiques, 161 p.
LASSERRE C., (2009), “Des bureaux pour toujours ? Reconversions au long cours” in DE BEULE M. & DESSOUROUX C. (eds. ), Bruxelles, ses bureaux, ses employés, Ministry of the Brussels-Capital Region & La Fonderie, Brussels, pp. 110‑119. MÉRENNE-SCHOUMAKER B., (1991), “Un problème métropolitain majeur : l’intégration des bureaux dans les espaces urbains. Le cas de Bruxelles” in La grande ville, enjeu du 21e siècle : Mélanges en hommage à Jean Bastié, Presses Universitaires de France. RECOLLECTE D., (1995), “Dernières évolutions de la localisation des bureaux en région bruxelloise” in Revue belge de géographie, 119, pp. 345‑355. VANDERMOTTEN C. & MARISSAL P., (1998), La production des espaces économiques, Tome 1, Editions de l’Université de Bruxelles, Brussels, 323 p.
VANDERMOTTEN C. (dir. ), D’ANDRIMONT C., ROMAINVILLE A., VAN HAMME G., WAYENS B., (2007), Localisations et délocalisations d’entreprises en Région bruxelloise, unpublished report for Eudip Two, ULB-IGEAT, Brussels. VANDERMOTTEN C., (2009), “L’état de l’économie bruxelloise vingt ans après la création de la Région” in Bruxelles [dans] 20 ans, Agence de Développement Territorial, Brussels, pp. 265‑291. 2 The present study was conducted in the framework of the publication of a collective work: DE BEULE M. & DESSOUROUX C. (2009), Bruxelles, ses bureaux, ses employés, Ministry of the Brussels-Capital Region & La Fonderie, special issue of Review of office property, Brussels, 256 pp. (table of contents available on the Review of office property website). It has, however, been revised and expanded with respect to the referenced work. 3 Floor area: the total surface area of covered floors with headroom of at least 2.2 m in all rooms, including recessed floors and attics as well as basements with offices or conference rooms. 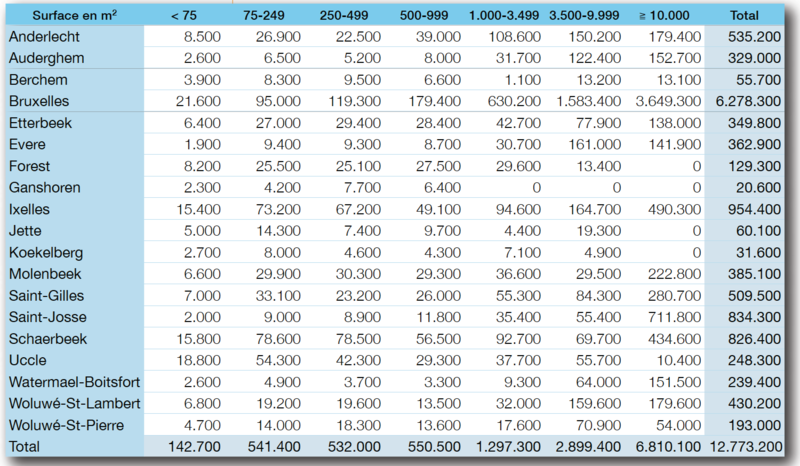 This does not include underground levels used for car parks, cellars, technical equipment, archives and storage. The gross surface area is equal to the sum of the floor area on each floor, walls and common spaces included, in contrast to the net surface area, which excludes common spaces (technical spaces, toilets, corridors, lift shafts, stairwells, etc.). 4 A semi-detached construction refers to a group of buildings within a block, located at a distance from the road and from neighbouring buildings. The alignment with respect to the street is usually respected. See the type map presenting the location of offices on page 21 of DE BEULE M. & DESSOUROUX C. (2009). 5 In contrast with the 1990s which were marked by postmodern or even pastiche architecture, the past decade has produced more striking architecture, both in the area of renovation (ex-INR, Place Flagey; Belmont Court, Rue Belliard) and new buildings (Royale-Brialmont building, Rue Royale; European Economic and Social Committee and the Committee of the Regions, Rue Belliard; Arsenal, Boulevard Louis Schmidt). 6 On this subject, see the map of modern architectural heritage (MAB) drawn by the SADBr (Société des Architectes Diplômés de la Ville de Bruxelles) which presents examples of buildings from the second half of the 20th century and the beginning of the 21st century. 7 Although office buildings are not necessarily sustainable in terms of reversibility (reuse as housing, equipment, etc. ), appreciable efforts have been made in the area of the reduction of energy consumption, above all in certain recent buildings. See in particular the article by Vincent Carton in DE BEULE M. & DESSOUROUX C. (2009). 8 The new areas for potential office development (e.g. West Station, Josaphat Station, Schaerbeek-Formation) will be discussed in more detail in the forthcoming article by M. De Beule in the next issue of Brussels Studies. 9 According to estimates, there are between 1.5 and 1.9 million m² of offices in the outskirts of Brussels (Vandermotten 2009). The figure indicates, first of all, the relative share of the surface area of offices with respect to the total developed surface area of each municipality, with all municipalities combined. 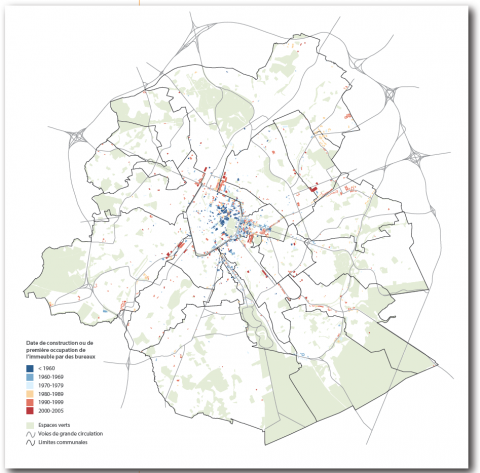 The proportion occupied by offices in Brussels (26.2% of the total developed surface area) and especially in Saint-Josse (37.6%) – a small municipality in the inner ring directly adjacent to the Central Business District – is very high. The municipalities located outside the areas favoured by offices – especially those located in the western part of the city – have very low percentages.The figure also indicates the relative share of each building size category in the office stock. High-rises are over-represented in the municipalities of Brussels and Saint-Josse, thus increasing the percentage of very large buildings, whereas the municipalities located further from the centre have relatively a high number of average-sized and large buildings, which is typical of the business parks and semi-detached offices which are commonly found there. Christian Dessouroux holds a doctorate in geography and is a researcher at the Institut de Gestion de l’Environnement et d’Aménagement du Territoire at the Université Libre de Bruxelles. He became interested in the role of public spaces in contemporary urban policies in Europe (doctoral thesis) before conducting research on the urbanistic development of Brussels in the 19th and 20th centuries, published under the title Espaces partagés, espaces disputes – Bruxelles, une capitale et ses habitants (2008). His interest in cartographic analysis and urban history has led him to contribute to several publications on urbanistic policies, transport and the history of Brussels. He recently coordinated a collective work with Michel De Beule entitled Bruxelles, ses bureaux, ses employés.